When we want to develop a trading system, which enters only N top-scored symbols from each of the sectors, industries or other sub-groups of symbols ranked separately, we should build appropriate ranks for each of such categories. This can be done with ranking functionalities provided by StaticVarGenerateRanks function. The formula presented below iterates though the list of symbols included in the test, then calculates the scores used for ranking and writes them into static variables. The static variables names are based on category number (sectors in this example) and that allows to create separate ranks for each sector. and show all ranked symbols instead. Such ranking information can be used in backtest and sample rules included at the end of the code use rank information to allow only two top-scored symbols to be traded. 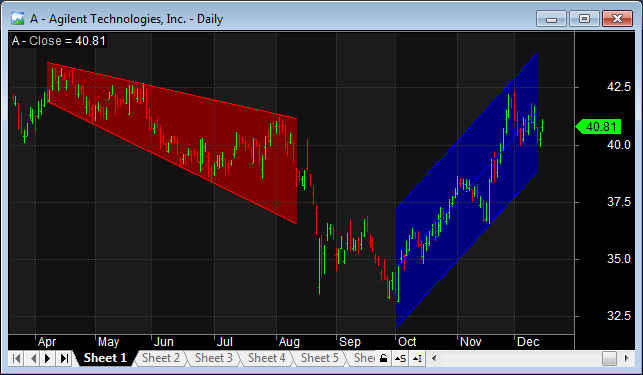 As explained in the this Knowledge Base article: http://www.amibroker.com/kb/2014/09/24/how-to-identify-which-signal-triggers/ such identifier tells us that the trade was closed because of the ruin stop activation. A ruin-stop is a built-in, fixed percentage stop set at -99.96%, so it gets activated if your position is losing almost all (99.96%) of its entry value. It almost never occurs in long trades, but it may be quite common if your trading system places short trades without any kind of maximum loss stop. Imagine that you short a stock when its price is $10, then it’s price rises to $20 (twice the entry price). When you buy to cover the position you must pay $20 per share, which means that your loss on this trade is $10 per share ($20-$10). This means 100% loss (as per entry value). If you placed such a trade with all your capital you would be bankrupt. That is why this stop is called “ruin stop”. Unfortunately, by the nature of short selling, the gains are limited to 100% (when stock price goes down to zero) but losses are virtually unlimited. So what to do to prevent exits by ruin stop? The best idea is to just place proper max. loss stop at much smaller percentage (such as 10% or 20%) depending on what your risk tolerance is, to limit drawdowns and decrease the chance of wiping your account down to zero. but it is highly discouraged, because when you wipe your account down to zero (or even below zero) it makes no point to run back-test any further. Instead of disabling this feature you should place proper, tighter maximum loss stop. 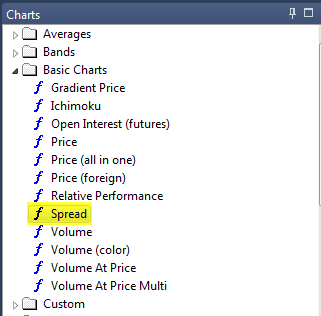 How does risk-mode trailing stop work? 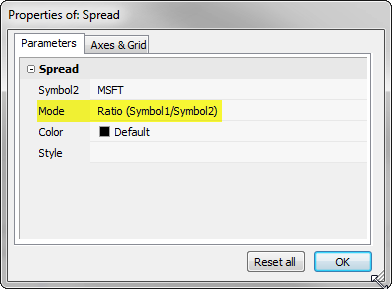 The primary symbol (Symbol1) is the one selected in the chart window, the other symbol (Symbol2) is defined in the Parameters window, as presented in the above screenshot. Symbol1 and symbol2 names in the above code need to be replaced with the actual symbol names from our database we want to use. How to change the title line in my custom indicator ? If we want to check such information using AFL code, we could read the list of symbols returned with CategoryGetSymbols and by counting commas (which separate symbol names) find out the number of tickers. Among built-in drawing tools, the Triangle, Rectangle and Ellipse allow to fill the background with custom color. 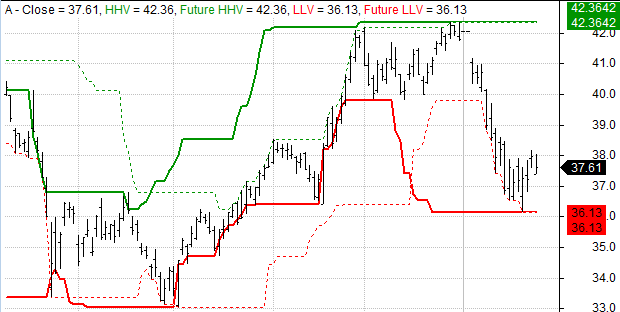 However, if we wanted to fill the space between manually drawn trend lines, then we could use AFL formula with Study function that allows to detect the position of the line. Then – knowing the arrays of top and bottom lines we could fill the area between with a cloud plot. A sample formula, which shows such implementation is presented below. 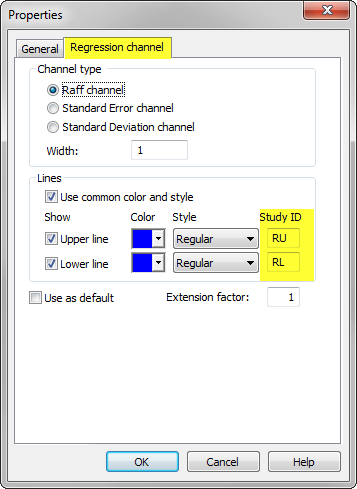 The code fills the space between L1 and L2 trendlines (red color) and between upper and lower bands of the regression channel (RU and RL study id’s respectively). 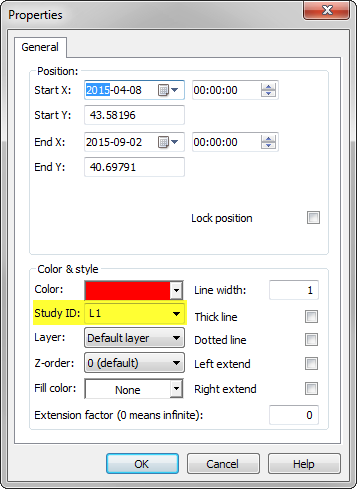 We need to remember that each line needs to have unique Study ID assigned in the Properties window. If we wanted to handle more lines, then it may be more practical to process the list of study ID’s defined in a custom string instead of individual function calls. For the purpose of counting trades closed by particular stop we can refer to ExitReason property of the trade object in the custom backtester. The custom backtest formula presented below iterates through the list of closed trades, then counts the trades, which indicate exit reason = 2, that is stop-loss. 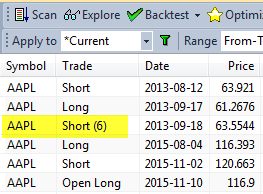 AmiBroker version 6.07 has introduced a strict check for correct string formatting in printf and StrFormat functions. These functions allow to specify the string followed by the list of arguments that will be inserted into the string in places, where %f, %g or %e specifiers are entered. It is important for the list of subsequent arguments to match the number of % specifiers in the string. 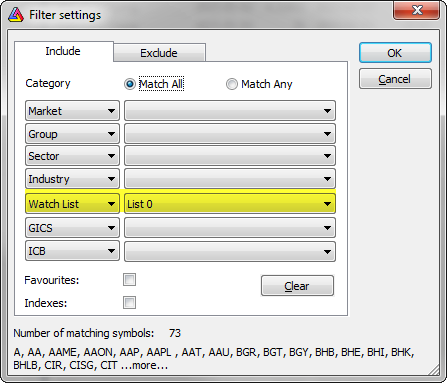 In cases, where there is no match – AmiBroker will display Error 61 message. Strict check is required because Microsoft C runtime crashes if wrong parameters are passed. Passing on earlier version was dangerous because it would lead to random crashes now and then depending on machine configuration. In this example formatting string contains four % specifiers so AmiBroker expects four arguments coming later, but five are given instead (too many). In this example formatting string contains five % specifiers so AmiBroker expects five arguments coming later, but four are given instead (too few). In this example user wanted to print just % (percent sign), but used % (wrong) instead of %% (correct specifier of literal percent sign). The example 3 requires special attention, as it is a common mistake. Due to the fact that % sign is a special character, we need to use %% in our string if we want to print % sign in the output string. When we want to execute certain part of code just once after starting AmiBroker, we may use a flag written to a static variable that would indicate if our initialization has been triggered or not. When Status(“stocknum”) is detected in the code, then execution is performed in a single thread for the very first symbol. Only after processing of this first symbol has finished the other threads will start.